Contributed by Anna Ryan, Jul 26, 2001 [annaryan001@hotmail.com]. Total records = 132. At the top of the town of Ballisadare turn right. The cemetery is down a narrow road to the right in an old ruined churchyard. It is not signposted from the roadway. Cemetery walked and read and transcribed in July of 2001 by Anna Ryan. Clarence, Joseph, d. 18 Oct. 1890, age: 50yr, "Father of Mary,Joseph,Hugh and Ann." Lang, Eugene, d. Jun. 1935, Headstone errected by Mary Lang,"
McDonald, Very Rev. P.J., d. 11 Sep. 1928, Parish Priest of Coolaney.,"
McLoughlin, Bridget, d. 21 Dec. 1958, Wife of Patrick, Bella. 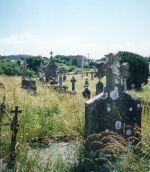 Collooney, Interred in Collooney cemetery.,"
Savage, Martin, d. 19 Dec. 1919, age: 21yr, Grandson of Michael and Mary, Who gave his life for Ireland at Ashtown. Dublin.,"